Liz was born in 1957 in Asia. In 1963, at the age of 6 years, Liz began performing at Benson’s Wild Animal Farm in New Hampshire. At Benson’s, Liz was housed with Queenie, who would come to Sanctuary with Liz in 2006, and Ruth, now living in the New Bedford Zoo in Massachusetts. Little is known about her years prior to Benson’s. After Ruth was sold to a private owner in 1978, Queenie and Liz continued to perform and give rides at the park until it closed in 1987. Both Queenie and Liz were then sold to Hawthorn Corporation, a company in Illinois that trained and leased elephants for entertainment. The pair spent the next 19 years traveling with different circuses throughout the country. When not traveling or performing, many of the elephants owned by Hawthorn Corporation were kept chained in a row in a windowless barn. This herd had known exposure to tuberculosis. In 2003-06, as a result of the USDA prosecuting Hawthorn Corporation over multiple violations of the Animal Welfare Act involving inadequate care and mistreatment of elephants, eleven elephants from Hawthorn were retired to The Elephant Sanctuary in Tennessee. This group of elephants’ poor health and history of exposure to tuberculosis necessitated special care and treatment for each individual elephant. Liz retired to The Sanctuary on February 2, 2006, accompanied by Queenie. 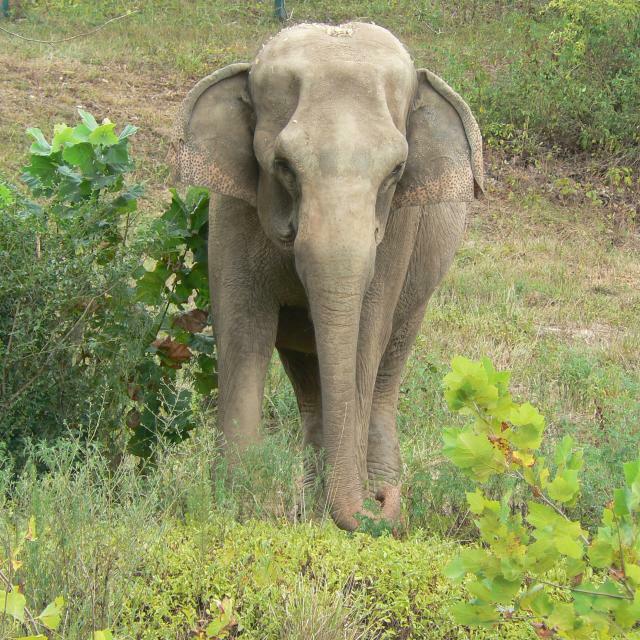 At age 49, Liz was the eighteenth elephant to retire to The Sanctuary. She arrived severely underweight, with chronic foot disease, her trunk mostly paralyzed, and exposure to tuberculosis. While the cause of her trunk paralysis is unknown, foot diseases are commonly seen among captive elephants when their time is spent restricted to small spaces and/or standing in place on hard substrates with little relief to the bones and joints supporting their massive weight. At The Sanctuary Liz formed close bonds with fellow former Hawthorn elephants Billie and Frieda. Liz, Billie, and Frieda became a strongly-bonded trio; their vocal reunions after the shortest separations could be heard throughout The Sanctuary. Care Staff note Liz was a particularly vocal elephant. Her “trademark” vocalizations included deep rumbling, bellowing, and trumpet-like “squeaks” that she would make in quick succession. Liz reportedly also pioneered her own unique style of napping - standing up, but with her rear-end resting against a tree or using a new mud wall created as part of habitat renovations to take the weight off of her feet and legs. 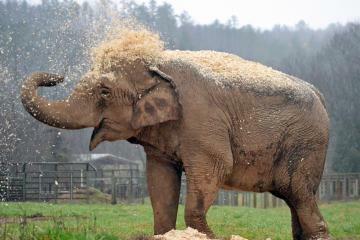 Challenged by her paralyzed trunk, Liz was still quite capable of feeding herself and even dusting and showering. She developed her own style of grasping food and swinging the bottom of her trunk up into her mouth. She was able to drink water on her own by swinging her trunk to her mouth, or taking the water hose offered by caregivers and putting it directly into her mouth. Liz surprised and delighted caregivers when she would squirt the hose in the air, giving everyone a bath. Known to have been exposed to tuberculosis, the elephants from Hawthorn were monitored in The Sanctuary for the disease. When Liz was found to be actively shedding TB-bacteria in 2009, she and her two companions were moved to a separate barn and habitat for quarantine and treatment purposes. This barn and habitat is referred to as Phase I. Updates in their treatments and monitoring allowed the trio’s reintroduction to the larger habitat in late 2014. Phase I barn was renovated in early 2015 with natural sand substrate for added comfort for the elephants living in the Quarantine habitat. In late summer of 2015, Liz’s health quickly declined. Staff noted her lost interest in socializing with companion elephants, eating less and displaying signs of intense discomfort. The Sanctuary’s Veterinary and Husbandry Team moved Liz to Phase I barn to manage any pain or discomfort and provide hospice care. Her caregivers brought Liz special treats, favorite foods including pumpkins and banana leaves, and hand-picked browse from areas of the habitat she could no longer access. Liz was humanely euthanized August 18, 2015 at the age of 58.